If you are a Canadian seller and selling products on Amazon Canada, you already have that benefit over the fulfilment aspect. However, if you are based somewhere outside of Canada like the US or other European countries, the shipping rates for your products may not be convincing for the Canadian Buyers. To get more convenient results, make sure you use some shipping tools like EasyShip or ShipStation. You need these tools to compare pricing between the rates offered by different shipping service providers such FedEx and others. The best way to bypass this hassle is to offer a free shipping on products with over certain product margin. Also, you can be subscribed to the FBA to get rid of this to a great extent, if applicable. Alike other Amazon marketplaces, Amazon Canada also has some similar rules regarding the product title, description, listing categories etc. If you are already selling to the Amazon US, most of these rules remain the same, apart from the product listing categories. Make sure that your product title doesn’t exceed over 150 characters and also take care about the quality of the image. You can’t use images with watermarks on them or low quality images. Also, if you are using the product description provided by the manufacturer, give some time to make some edits. Make them more clear and concise. 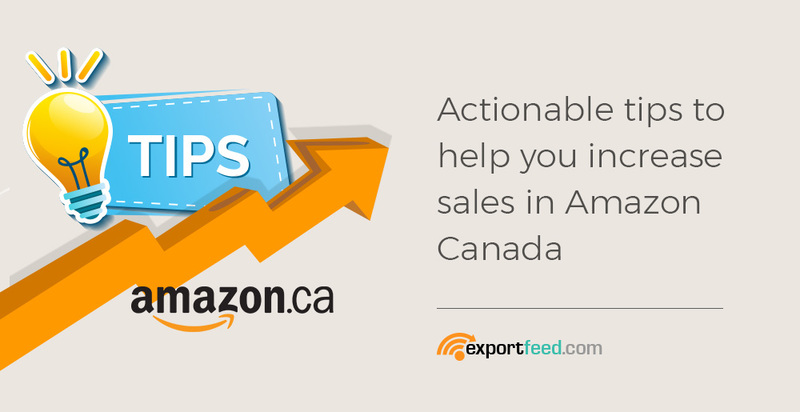 If you are already selling through your Shopify, BigCommerce or WooCommerce store and want to expand to Amazon Canada, you want to list a lot of your high selling products on Amazon Canada. For this, you can use our apps for these platforms. If you are listing and selling your products to Amazon Canada, you are selling them to the visitors belonging to Amazon Canada. They are the customers of Amazon Canada and you need to maintain the Amazon standard. “Amazon Standard”, it can be a bit vague term. Think about the Amazon Prime in this regards. Make sure that you deliver the products on time and as expected. The loyalty of customers are towards Amazon is only as good as the sellers on Amazon treat them correctly. Make sure that your account’s standings on Amazon Canada is healthy. This is the seller rating on your Amazon Seller Central. Getting product reviews from your customers will help you to get higher seller ratings. It is a common tip but this also works well when selling through Amazon Canada. Use the regular sales price and the discounted price when listing your products. However, for bulk listing of your products, it will definitely be time consuming. Luckily, we have already included this in ExportFeed services. …what more can you get from ExportFeed? Create bulk products listings of your WooCommerce, Shopify and BigCommerce based stores on Amazon marketplaces without wasting time. Customize your product attributes as required to optimize your product listing on Amazon for increased sales. Authorize our MWS developer account for the North American and European Amazon marketplaces to directly upload products and sync orders and inventories for Shopify and WooCommerce. Get extremely helpful support to resolve the product listing issues. Experience all these and more while you’re still on the trial plan. You can also request for a free Amazon feed setup, even if you are on the trial plan.